Listed here is the tying materials by Hends. 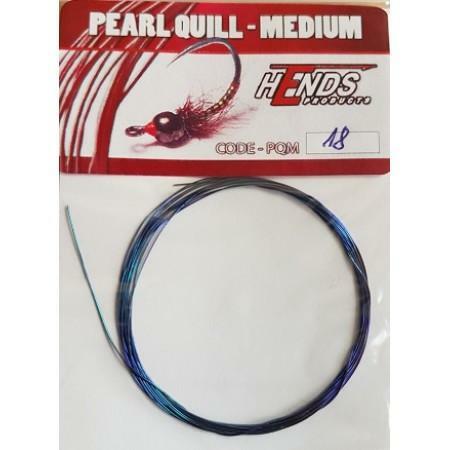 Hends has some very unique tying materials that we are happy to bring in to the U.S. market. Another fantastic addition to the European fly fishing market that specializes in Czech nymphing. Body Quills is a translucent ​body wrap. This very fine material makes midge tying a breeze. They are solid-colored for a perfect uniform body. 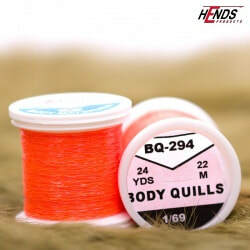 Buzzer Quills are the same as body quills, but they have a small dark side for an extra dimension. Pearl Quill is a very small oval body wrap. It has a pearlescent shine that mimics air bubbles very well. Perdigones is a flat pearl tinsel for bug bodies. Coming in 2 sizes, and a good selection of colors. 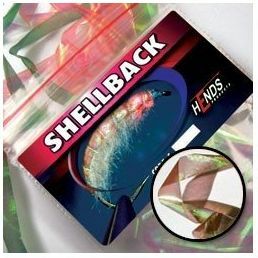 These are very popular in tying flash body nymphs, with a UV glue coat over it. 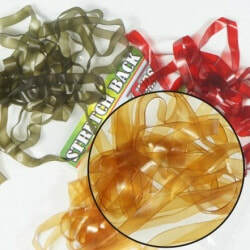 This elastic shell back material is perfect for all nymph tying. Giving a natural look to your fly. This material comes in two sizes and great color selection. 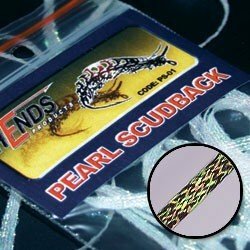 Pearl Scudback is a pearlescent flat braid made for shell backs. Though not limited to backs, its can be used for bodies, too. Spectra Flash is the Spectra dubbing woven into a shell back. This shell back differs from others with its naturally ribbed appearance. Making for a natural looking bug with an added spectrum of light.